Website Traffic Good And Bad. What is Website Traffic? You are here: Home / Internet Marketing / Website traffic, good and bad. 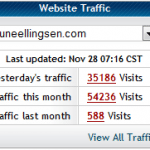 What is Website “Traffic” really? And it’s true in every sense of the word. Any visitor to your site counts as “traffic”. Also any bot crawling your site. No visitors essentially means nobody is interested in reading, sharing, joining or even buying your stuff. Goes without saying really that without it, your business is doomed to fail! Let’s take a semi-deep look on what website traffic really is, and how the different types of traffic work. What do you mean? All traffic work right? – BUZZER: NO! – Aim to get targeted and engaged interested prospects. Yeah sure, visitors are visitors right??? BUZZER: NO! – Again… TARGETED. Let me tell you a brief old story to shed some light on BAD TRAFFIC. The other day (back in 2012) I ordered some traffic to my blog to see whatever result I got from it. It was traffic from allover the world, un-targeted, and it was directed to one of the pages on this site where I give away some free stuff. We used Adf.ly for this example. There you see the results from the first day. And here are the results of the second day. These results are normal when you buy traffic and that is why it makes marketing efforts easier when you invest in your company. However… These leads came from a landing page where I presented a free offer. Which can mean that the visitors are freebie-seekers. *A race of human relatively unknown to the common Joe. They seek all free stuff but never (or rarely) use it. Kind of like “mud on your tire”. – Don’t get me wrong I like mud too! Anyways…. My stats in Aweber confirmed the hunch of this. Most of the visitors were there just to get the initial gift and a large number ( too big ) dropped out and unsubscribed. If I had been more persistent back then as I am now I would have done an extra effort to convert freebie seekers into interested prospects. But I would advice against it. First off, there is a lot of BOT traffic. Secondly it can be downright illegal to use on certain networks, due to this. So IF you want to test them out it is cheap but you must be warned that most networks would not allow it. Check with your affiliate/CPA network before sending traffic to any of their offers. This particular traffic is not anywhere near good enough for my project. When you encounter a LOT of bot traffic and overall poor response numbers from your traffic source, run! It’s as bad as it gets. So that is a short case study on poor value traffic. It is recognized as low engagement from your hits. It CAN be used for some projects but as mentioned above, there are other sources needed for serious growth. Targeted HOT traffic is what you want. Cold, Warm, Hot AND Targeted is some of the words that define your traffic. Adf.ly traffic is cold. Media buys in general is cold. Unless you do proper targeting where you only buy ads to show to the ones most likely to be interested in your stuff. And also re-targeting, sending multiple ads to interested over and over. Cold traffic to explain, is where you advertise to people that has never heard of you, they may like weight loss, but have never seen your ad before. So they may click but is on the fence in regards to the offer they are presented with as they have no idea as to if it will work or not for them. If only they had known your name… Trust and recognition is vital. You need to show your ad 7 times before it get’s imprinted as “safe” with most people. If you do a re-targeting campaign of some sort where the visitor has seen your ad or site before and clicks again… That prospect is WARM. Willing to read more. A HOT visitor is the one you nail with your message and targeting. It’s the one that is truly passionate about getting your stuff. Then you get the answer and then again, you can promote according to the answers they gave on a survey. Another HOT visitor is someone that has bought your stuff from before and is in between upsell 1 and two.. Or main product and upsell. If someone already has spent their hard earned money with you then the chances for them spending more money is high as they already have lowered their guard and started trusting you. A Hot visitor can also be one that has just gone ahead and gotten your products. When you email that person the lead is still HOT. Possibly ready to invest more, IF you have nailed your targeting and audience. At least in general for a couple of weeks. This is in general and not written in stone as said. If you nurture your list well it may be highly responsive for a long time. What is website traffic from… Space? Well, yes. Earth is in space… So that is a valid sentence! Below is a few of the tactics that is worthy of mentioning when it comes to driving targeted traffic. Now we can start off with Media Buys. It works like this, you pay for your ad in display on a site or a number of sites. And your ad drives traffic to your desired site. It’s FAST, like fastest… But will set you back a little coin in the beginning. When approaching Media Buys it is of utmost importance that you get your target audience as drilled down as possible. Like if you use Facebook ads then you can “hyper target” your prospect with a huge number of options so you can be sure that ONLY the persons interested in what you are selling will see it. Other networks have similar targeting. So the KEY here is to have a product ready and you MUST KNOW your perfect audience. It’s a good idea to drill that down BEFORE you invest in this kind of website traffic. You should know your target audience from before but if you are unsure then go deeper and find out more. Creating a product and delivering it in a launch is a sure fire way to get interested prospects on to you list. This is a big topic which I will not cover in great detail here and now. BUT, what I will add is that this is best traffic in terms of mo-ney. People you get to open up their wallet are the people that will pay your bills, now and days, weeks and even years to come IF you play your cards right. The first barrier has gone with these people, they already bought your product. So there is trust. As long as your product is worth the cost. Or more. Search Engine Optimization can be complex. What it means is that you can improve your site’s content and structure according to Googles guidelines to get as high on Google’s search results as possible. Then it is “optimized” for the search engine. You have on-page SEO and off page SEO. On page is in example your article, or this article for that matter where we target a keyword like “what is website traffic”. Using Yoast SEO plugin you can follow the steps to get as good rating as you want. But this is easy…. The hard part is Off Page. So this is not magic either but takes more time. It’s all about sharing your site with as many relevant pages as possible and getting your link indexed on as many other sites like that as possible. BASICALLY that is it. If enough off page work is done then Google will see your site as an authority site. Of course there are more variables here but the bottom line is IF you choose SEO it may take time to get visitors but IF you can make your site rank high, then the traffic can be both passive and free. Having the word spread for your business with a Press Release is highly efficient as it brings fast results you can measure. If you are good at writing and have a good article to share then why not use what is known as Mainstream Media instead of all other tactics. You can get exposure for any article you write. However for it to be reaching the top news channels you can expect to be paying for it. In general a Press Release can be done Free, or paid. You can submit yourself to a ton of channels, and you can also use software both free and paid to aid the publication process. Outsourcing this is easy also and can be done with a small investment starting from 5 bucks. You can expect to get a lot of traffic and backlinks from this. If you’re going for the top news channels, be sure to have a good server so it don’t crash due to high volume. ALSO a factor for off page SEO. This is the traffic you get from social networks like Facebook, Twitter, Pinterest and many more. You get traffic by posting your articles, interacting with the people, joining related groups and sharing content with value and direct traffic to your site. A blog like this one can help bring in customers to your business. So a blog can get traffic from all sorts of places. But since it is “parked” where people can see it… People drop by. This requires traffic anchors, like if you have submitted your link somewhere or your keywords rank or other. And on your blog you can redirect even more traffic to other sites in your network. So it’s a win win. Guest blogging will also increase your reader count. You can contact blog owners in your niche. Offer to do a guest post and bring your most valuable content, or close to it in an article. Be sure to link back to your site in it. This gives you long term traffic which you have already warmed up with your stellar content. Be sure to get your content on a high traffic relevant blog. You can ALWAYS get more traffic. There is literally unlimited with website traffic sources out there. Just be sure to keep on adding value and drive relevant website traffic at the same time so the people who do visit might want to come back again for more. If you are looking for massive exposure to your business I do accept clients on a arecurring basis where I drive traffic to them. Price is $500.00 Per Month. If you feel you could need it, you can reach out to me and I can tell you some more about it and see if it fits to your business. It will fit most, but if you are planning some really really competetive terms then we need a grand strategy as a basis before deplying traffic from my service. Details can be discussed and I can deliver bigger packages as well.